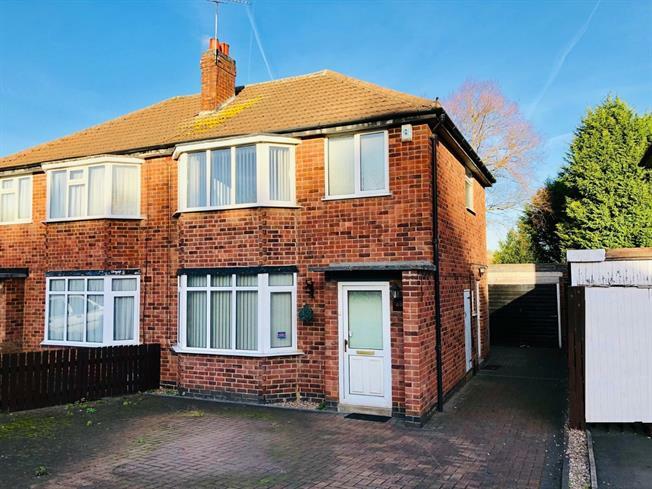 3 Bedroom Semi Detached House For Sale in Leicester for Offers Over £220,000. This Three Bedroom semi detached family home is pleasantly situated within a highly sought after location within the village of Birstall and comprises briefly of main entrance hall, living room, dining room, fitted kitchen, landing to three bedrooms, shower room, Block paved front drive and great sized rear landscaped garden, external detached garage, off road parking. Internal inspection comes highly recommended. UPVC front double glazed door, opening onto the driveway. Radiator, laminate flooring, painted plaster ceiling and ceiling light. Double glazed uPVC bay window facing the front aspect. Radiator, laminate feature flooring, chimney breast with stylish electric fire, painted plaster ceiling, feature lighting and wall lights. UPVC patio double glazed door facing the rear aspect opening onto the garden. Radiator, laminate feature flooring, painted plaster ceiling and ceiling lighting. UPVC double glazed door facing the side aspect opening onto the driveway. Double glazed uPVC window facing the rear aspect overlooking the garden. Tiled flooring, painted plaster ceiling, ceiling lighting. Roll edge work surfaces, a range of fitted units, stainless steel sink, integrated oven and hob, over hob extractor, space for washing machine, pantry. Access from main entrance hall, leading to. Double glazed uPVC bay window facing the front aspect. Radiator, carpeted flooring, painted plaster ceiling and ceiling light. Double glazed uPVC window facing the front aspect. Radiator, carpeted flooring, painted plaster ceiling and ceiling light. Double glazed uPVC window with obscure glass facing the rear. Radiator, vinyl flooring, painted plaster ceiling, feature light. Low level WC, double enclosure shower, pedestal sink. Landscaped rear garden with patio area and pathway leading to lawn, hedged and fenced borders, a range of mature shrubs and plants, gated side access leads to driveway and front garden being landscaped. Located to the side of the property is a single detached garage with up and over doors.